Pure announced that it will be replacing it’s entire M series line of all-flash storage arrays with the X series NVMe arrays. 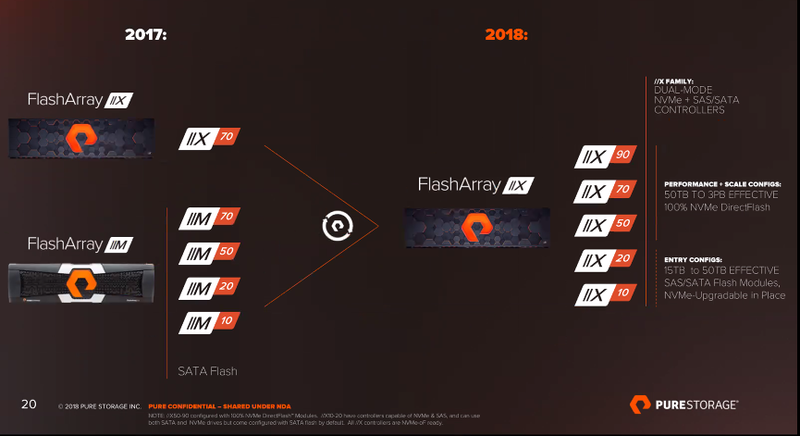 Prior to the announcement, the M series FlashArray used SATA based flash modules while the only NVMe based array, the X70 used the company’s new NVMe drive modules. Now, the M series arrays will no longer be sold and taking their place will be the X10, X20, and X50 arrays. A new X70 will also be sold and a new flagship, the X90 has been intoduced. Currently Pure does not support end-to-end NVMe as there isn’t support yet for NVMe-OF interfaces. However, there are plans to support it on these new arrays. Additionally, the lower tier arrays, the X10 and X20 support SATA flash but are DirectFlash ready, which is Pure’s name for NVMe flash. This way customers can still take advantage of an all-flash array without having to do a forklift upgrade if they need to upgrade to NVMe storage. Current customers can take advantage of the new arrays through their evergreen storage program. With Pure, NetApp, DellEMC, and HPE all announcing arrays that have or will support NVMe on flash storage, only Pure is supporting NVMe on all arrays rather than just on the high end. Pure looks to make the technology more mainstream rather than an exclusive feature. That wasn’t the only thing announced. Pure is working with nVIDIA by using their FlashBlade scale-out NAS with nVIDIA DGX-1 servers for artificial intelligence development. Announced was the introduction of the AIRI Mini. AIRI stands for “AI Ready Infrastructure”. The AIRI mini is a system with 7 blades capable of 364 TB of data effective, 700k NFS IOPS, and has 16 GPUs that can perform 2 PFLOPS.